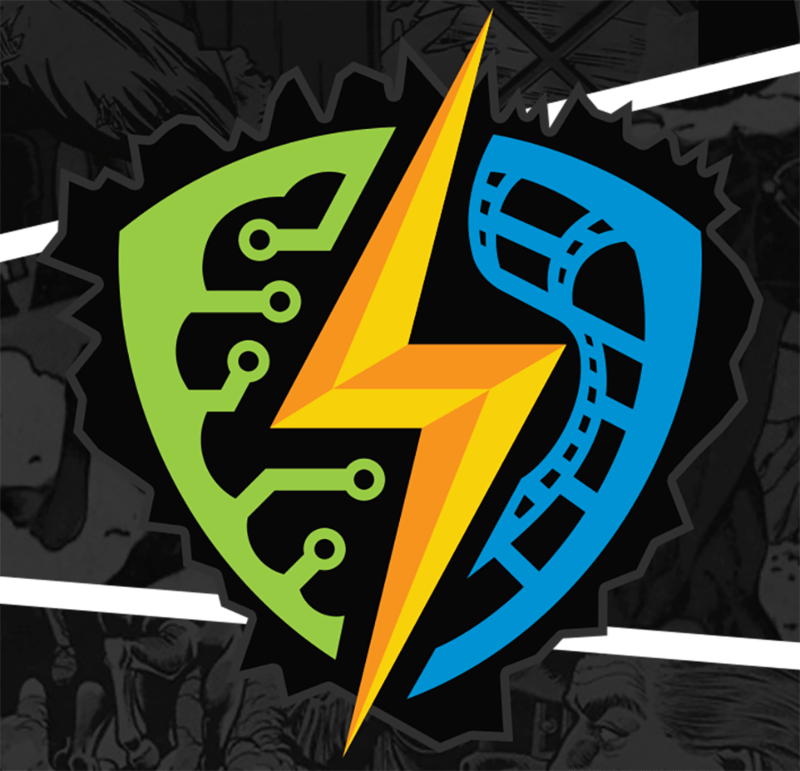 Going to the Silicon Valley Comic Con this weekend? Look out for Kirby stuff, Kirby studies, and ace cartoonist Mark Badger! Manning a booth on behalf of the Kirby Museum (that would be booth AA2 H) in collaboration with underground comix artist Bruce Simon. 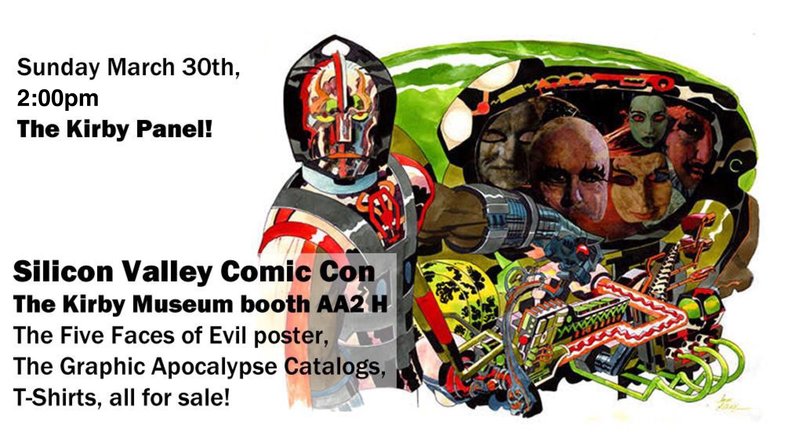 They’ll be selling the Four Faces of Evil poster for the Museum, plus Museum T-shirts and sundries, plus examples of their own work–and copies of our Comic Book Apocalypse catalog, as a Museum fundraiser! Did I mention Mark’s own work? How about his amazing, multipart Abstract Kirby project? 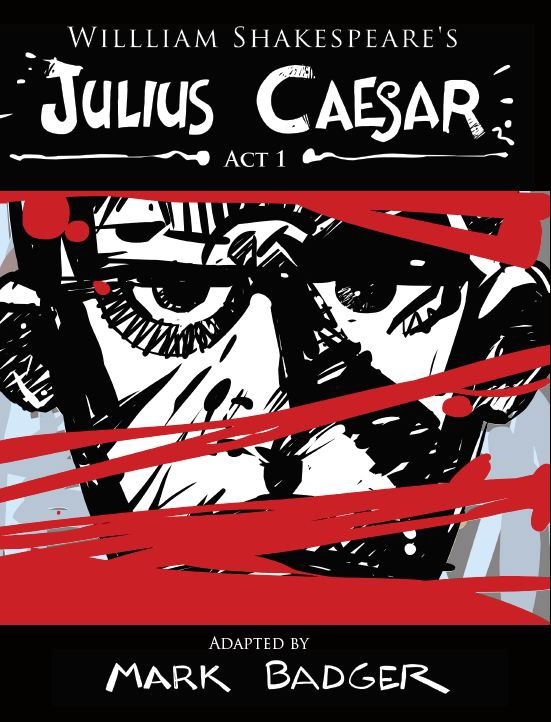 How about his now complete Kirby-inspired opus, William Shakespeare’s Julius Caesar, collected for the first time anywhere, just in time for SVCC? Great stuff. If you don’t know Mark’s comics, you’re missing out on some wonderful cartooning. 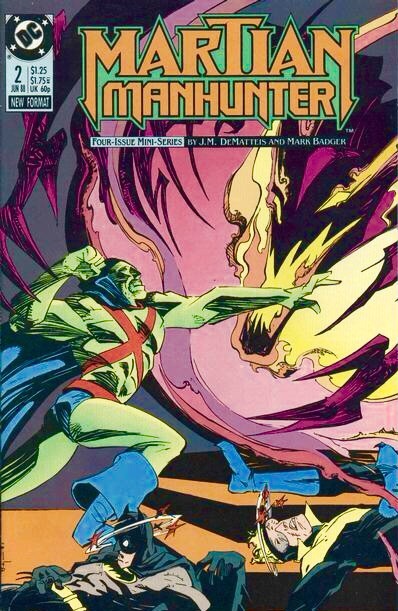 I learned to recognize his work back in 1988, when his pencils, inks, and colors on a Martian Manhunter miniseries (scripted by J.M. 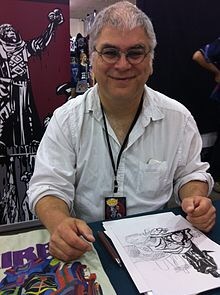 DeMatteis) hipped me to his distinctive style: swooping, slashing, and bold, abstracted into modernistic pattern and pure vectors of force, taking lessons from Kirby and Picasso alike and wreaking havoc with superhero conventions. 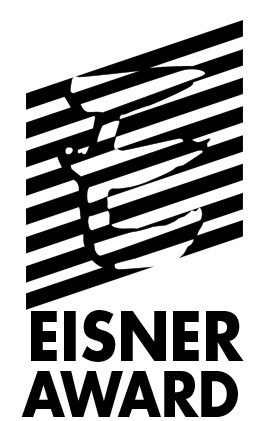 I followed him to later projects such as Batman: Run, Riddler, Run (1992, scripted by Gerard Jones) and Animal Rights Comics (1996, scripted by Joyce Brabner). His resume since then has been strange and awesome. Mark is not only a terrific comics artist, but also a teacher and activist. His current projects, such as Just Draw, pull these threads together. His “Daily Kirby” exercises (a 3-year-long series of devotional studies to the King) have to be seen to be believed. Read more about Mark’s career here, and if you’re going to SVCC, look up Mark and tell him I said hello and thanks! Mark’s been one of the voices reminding me of just how important it is to keep up the dialogue between critics and artists–and his own recent work amounts to an amazing creative and critical encounter with Kirby’s work.